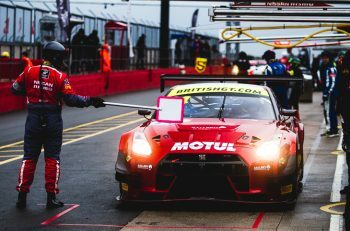 Barwell Motorsport will go into Sunday’s two-hour British GT Championship season finale at Donington Park with a very strong front-row lock-out. 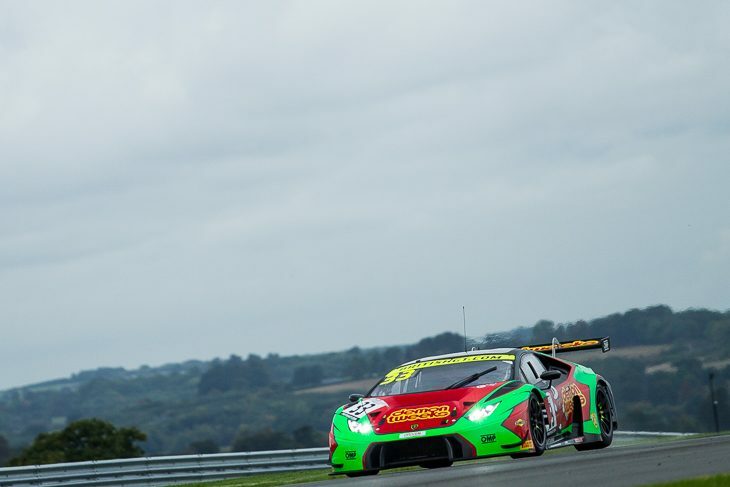 The #33’s Jon Minshaw and Phil Keen were untouchable in their respective qualifying sessions on a wet but drying track, giving them a margin of 1.6 seconds over their team-mates in the #69 Lamborghini. Minshaw in particular was a class apart from his competitors from flag to flag, with nobody getting within a second of him at any stage and a best lap of 1:42.180. Keen was fastest overall with a 1:39.292. Jetstream’s Graham Davidson (1:43.402) and Barwell’s Sam de Haan (1:43.582) posted the second and third-quickest times in their 10-minute Am session, with Optimum’s Flick Haigh taking some time to build to a fourth-fastest time of 1:44.620 in the session. Beechdean’s Andrew Howard separated championship hopeful Haigh from her other rival Mark Farmer in the #11 TF Sport Aston. The intrigue in the following Pro session was whether Optimum’s Jonny Adam could switch ahead of the Jetstream Aston Martin and although he went quicker than Martin (a 1:40.255 vs a 1:41.059), it wasn’t enough, so they’ll start fourth. Will they be thinking three places ahead to their rival in the lead, or three places behind to seventh place, which is the lowest they can finish to clinch the title if #33 does stay at the head of the field? Nicki Thiim moved the #11 TF Sport Aston, another championship contender, up to fifth on the grid with a 1:40.286, ahead of its sister #17 car, leaving the head of the pack very finely poised. Problems restarting the Balfe McLaren between the two qualifying sessions meant that Mike Robinson could only post a single lap and so they’ll start 10th, behind the GTC-class Ferrari but ahead of the RJN Nissan and #1 Team Parker Bentley. Darren Turner’s session was also curtailed with a broken exhaust, so Andrew Howard’s good work was undone as the #99 Beechdean Aston fell to eighth, behind a flying (1:39.992) Yelmer Buurman in the ERC Sport Mercedes. 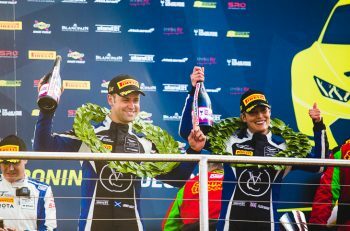 Century Motorsport’s title-chasing pair of Ben Tuck and Ben Green will start Sunday’s two-hour title-deciding British GT race from pole position in the GT4 class, joined on the front row by Finlay Hutchison and Daniel McKay in the #10 Equipe Verschuur McLaren. Third and fourth are the #72 Ben Barnicoat/Adam Balon Balfe Motorsport McLaren (the highest Pro-Am qualifiers) and the #62 Matt Nicoll-Jones/Will Moore Aston Martin – the latter duo still with an outside chance of taking the title. The third row of the grid is made up of the #61 Jan Jonck/Tom Wood Academy Motorsport Aston and the #4 Michael O’Brien/Charlie Fagg-driven Tolman Motorsport McLaren. Qualifying seventh was solo championship leader Jack Mitchell and his co-driver Dean Macdonald. Mitchell has a 10-point cushion on his Century team-mates Tuck and Green, but the latter also have a 15-second pitstop success penalty to contend with, so an intriguing contest has been set up for Sunday’s race. Eight on the grid is the Scott Malvern/Nick Jones Team Parker Mercedes, with the Patrick Mathiesen/Callum Pointon HHC Ginetta ninth and the #5 Jordan Albert/Lewis Proctor McLaren completing the top 10. 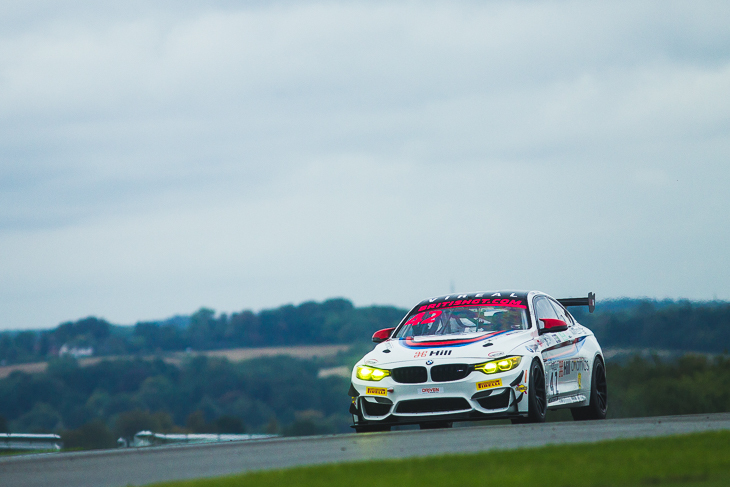 The Am and Pro portions of GT4 qualifying took place on cold and damp, but not fully wet, track, with no red flags or other interruptions to running throughout the sessions, although several cars had times deleted due to track-limits infringements.